5 inches of pure ice. 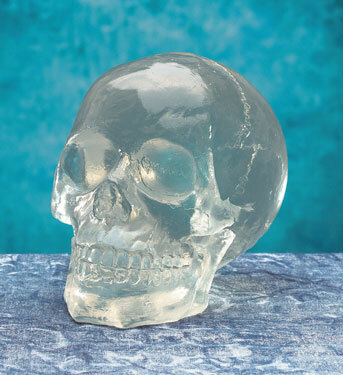 This is one cool skull, looks almost like an icecube, but much taller. Just don't try and put him into a martini glass, he would look really cool next to a brandy snifter though! Buy two and you'll have a great set of bookends. The picture actually makes the skull appear much smaller than it really is. This is a heavy skull, shipping weight is 6 pounds (including protective packaging).